London. 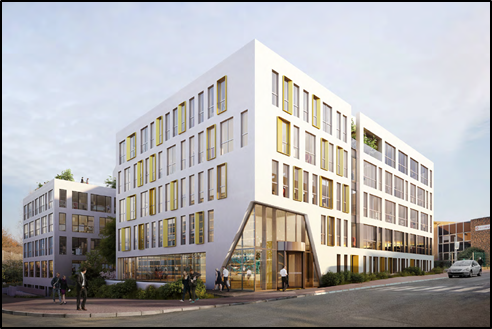 Tristan’s European Property Investors Special Opportunities IV (EPISO 4) Fund in a joint venture with STAM Europe have acquired a development site to build a five-storey, energy efficient office building providing 14,500 sqm of prime office space in Val-de-Fontenay (eastern Paris). The partners will carry out the construction alongside developer BPD Marignan. STAM Europe will be responsible for Asset Management. The site is ready for immediate construction to achieve the delivery of an energy efficient building in line with latest construction standards in Q2 2020. Jean-Philippe Blangy, Managing Director – Portfolio and Asset Management, Tristan Capital Partners, said: “Situated to the east of Paris, ten minutes from Châtelet transport hub, Val-de- Fontenay has emerged as a very dynamic submarket, attracting large corporate and public sector occupiers such as Société Générale, RATP, and BNP. The new development will be located within a few minutes’ walk from a two-line RER crossing, and within close proximity to the A86 motorway interchange for Paris’ peripherique and to south-east and eastern suburbs. Pierre Arcens, Deputy Managing Director Office Property Development further comments: « BPD Marignan is very proud to be part of this strong partnership to launch this HQE, BREEAM and Effinergie + certified project designed by Quadrifiore Architects».